Check out a few ways to enjoy your screen porch this fall! Every fall the world explodes into a riot of reds, oranges, and yellows as the trees all turn and the leaves begin to fall. As the air gets chilly and the seasons change, take time to yourself or with your family to enjoy it all curled up on your screen porch. 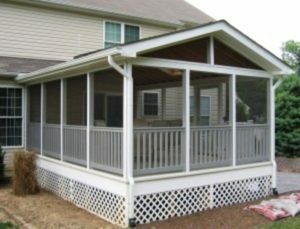 The screened in porch is a great aspect of any home, and there are many ways to continue enjoying your porch this fall. If you have the space on your screened porch to safely and securely install a TV, this will add a whole new dimension to your leisure and party activities. Invite everyone over to watch the big game on Sunday, and you can all spread out on the porch. You won’t have to worry about being too noisy and distracting the kids who are doing their homework, or about the house getting too hot with all those people. For a more low key day, have a family movie party: curl up under warm blankets on the porch and enjoy the sounds of nature and the cool breeze while you watch your favorite flicks. It’s like being at a drive-in without leaving your house, a cheap and fun day or night in. Camping is one of the quintessential summer and fall activities. There is nothing like sleeping out under the stars, hearing the night sounds around you, and enjoying a warm fire. But sometimes you don’t have the time or means to stray far from home. Host a sleepover and “camp out” on your screened in porch. Your “campers” will be safe and secure all night, and you still get to sleep in your bed. Plus, there won’t be any bugs to worry about. If you have a fireplace on your porch, you could even have s’mores. If you’re feeling a bit of a disconnect from your family with all the hustle and bustle of fall, set aside some family time on the screened porch. Plan a game night, turn up the lights, and reconnect while you introduce your kids to a favorite (non-digital) game. Alternatively, you could just curl up on the couches and talk. If you have a fireplace or grill, bust out the s’mores and reconnect.